Directly or indirectly, your CEO will be the one evaluating, funding, and rewarding your intrapreneurial project. The better that you understand her hopes and fears, the easier it will be to identify and deliver innovations that she finds exciting. The #1 thing that your CEO cares about is growth. Revenue growth. Profit growth. And, ideally, growth of both of the above. Why the obsession with growth? Growth Attracts Resources - In a free market economy in which all participants are trying to maximize profits, resources flow to the organizations that produce the best returns. Growing companies produce higher returns than stagnant or shrinking companies. Eventually, if your company doesn’t grow fast enough to stay competitive with other investments of similar risk, investors / owners will withdraw their support and the organization will die. 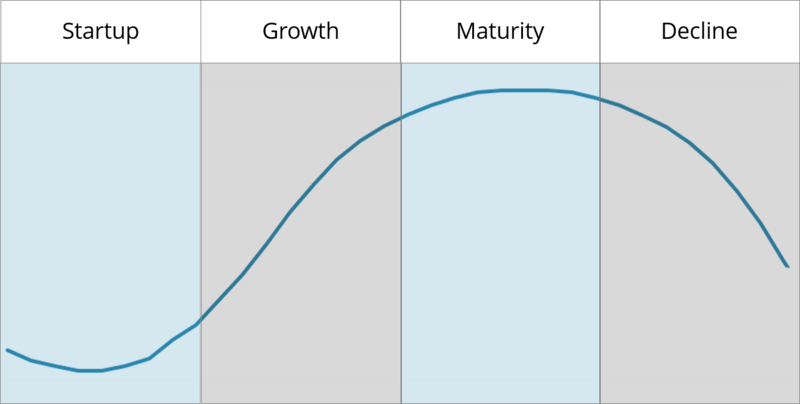 Everything Else Is Baked Into the Long-Term Growth Curve - It’s sort of impossible to achieve long-term growth without doing pretty much everything else right too. Wrong strategy? Growth declines. Poor execution? Growth declines. Treat your people badly? You guessed it -- growth declines. So when a CEO wants to know, “What kind of job am I doing?” the growth numbers tell the story. KEY TAKEAWAY: If you want to be a successful intrapreneur, look for ways to increase growth. If Growth is the ultimate prize of your CEO’s dreams, the Business Life Cycle is the evil dragon that threatens to steal it away. What is the business life cycle? It’s a theory that says that, similar to biological organisms, every value proposition that your company creates will go through distinct stages of life that may be characterized as Startup, Growth, Maturity, and Decline. To put it more bluntly, the business life cycle says that everything your company is doing today to create value and make money -- every product, every service, every big idea -- will eventually die. 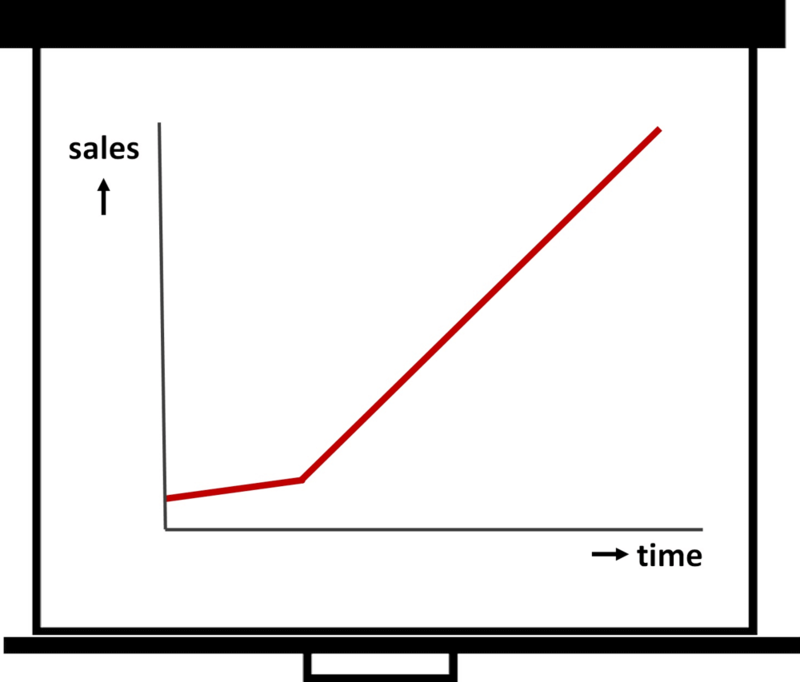 How long does it take for a technology or value proposition to run its course? 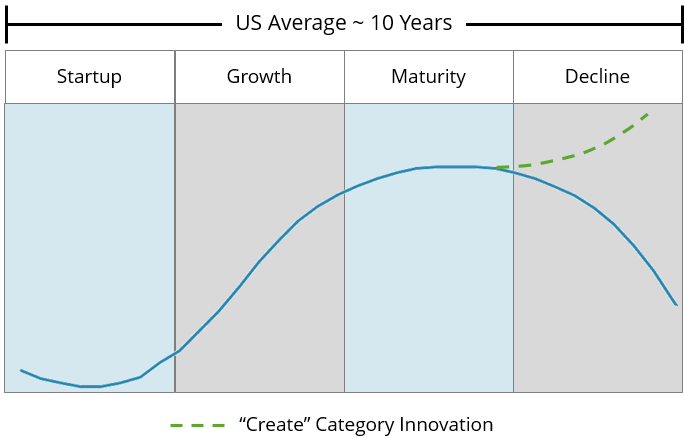 Today, the average is about 10 years, but many believe the cycle is getting shorter due to accelerating rates of innovation and globalization. For example it took 75 years to for landline telephone service to gain 50 million users worldwide; Angry Birds took only 35 days. KEY TAKEAWAY: The clock is ticking and your CEO knows it. If the company doesn’t add more sales and profit this year than it did last year, your CEO is feeling anxious that your organization is starting to mature or decline. If Growth is the prize and The Business Life Cycle is the dragon, Innovation is the daring hero who saves the day. At the highest level, innovation may be defined in three words: intentional, positive change. 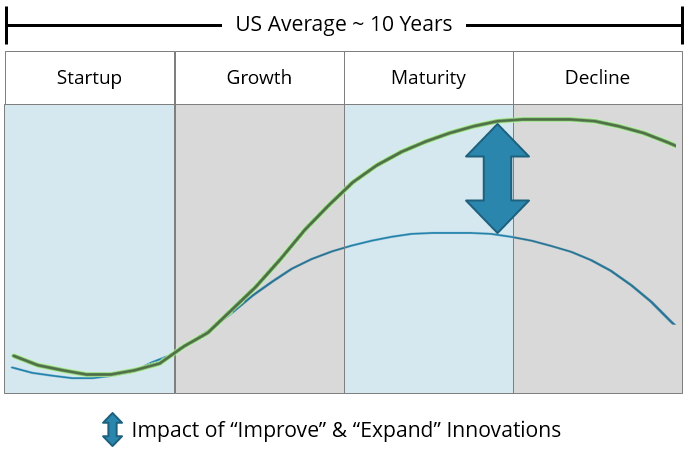 Innovations in the “Improve” and “Expand” categories lift and lengthen the business life cycle of your current value propositions and are ideal for organizations that are in the Growth or early Maturity stage. Innovations in the “Create” category regenerate the organization from within by creating entirely new lines of business that can sustain the company into the future. “Create” innovations may not be a fit during the Growth stage, but will be desperately needed as your organization matures and declines. You can help your CEO by identifying and implementing innovations that improve, expand, or create value propositions. 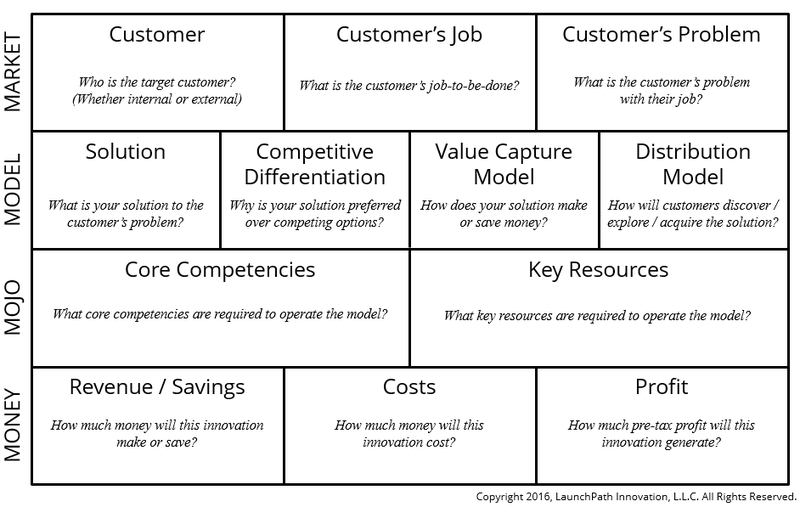 Specific opportunities for innovation may be found within one or more of the 4 components and 12 sub-components of an innovation detailed above.